1. Preheat the oven to 200˚C, gas mark 6. In a roasting tin, toss the sliced potatoes and lemon with the ’nduja. Spread it in one layer, pour in 2 tbsp water and bake for 12 minutes. Stir the peppers into the potato mixture and add the fish; season and baste. Add 2 tbsp more water; bake for a further 13-15 minutes until cooked through. 2. Meanwhile, wilt the spinach over a low heat. Squeeze out any excess water, then mix with the parsley, capers and olive oil; season. 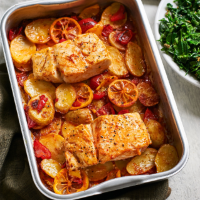 Divide the fish, potatoes and lemon between 2 plates and top with the dressed spinach.